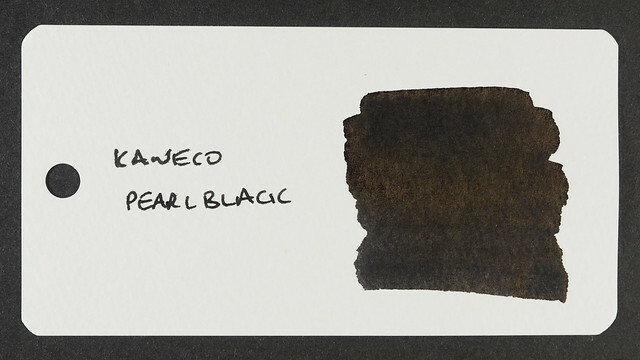 The latest batch of ink reviews will cover all the currently available Kaweco Fountain Pen Inks, and the first in this batch is for Kaweco Pearl Black. These reviews also mark my first serious attempt at using lighting cube I received at Christmas. I need to play around with the setup a bit more – the exposure isn’t quite how I want it yet, there’s a curious colour cast coming from the right in some of the photos and the arrangement could be better. 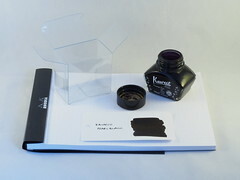 The ink is supplied in a 30ml glass bottle, which is a model of simplicity, and in my view all the more elegant for it. It is almost identical to the bottles used by Pelikan for their 4001 and highlighter inks. The sloping sides allow the bottle to be rested at an angle, which should make it easier to get the last of the ink out when necessary, although the bottle is too full at the moment to try that out. The bottle arrived in a clear plastic box, which almost looks like an afterthought in the design process and I can’t imagine offers much protection, other than to stop the two strips of paper which act as a seal breaking in transit. I haven’t come across a seal like this in other ink brands and it really contributes to the retro styling, but it does feel like a shame when the time comes to break it. The retro styling carries through to the front label, which looks like it could almost date back to the founding of the company in 1883 (or at least to the early 1900s). 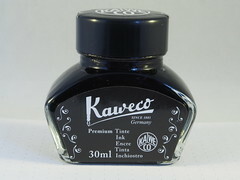 The text is white on black, in fact with all the Kaweco inks the front and top label/sealing strips use white text on a background to match the colour of the ink, which is just as well as the label doesn’t actually stated what colour of the ink is (only two of the blue Kaweco inks state the colour on their labels). The bottle cap is plastic and smooth but not too glossy so almost looks like bakelite. Despite the small size of the bottle, the neck is wide enough to allow easy access. 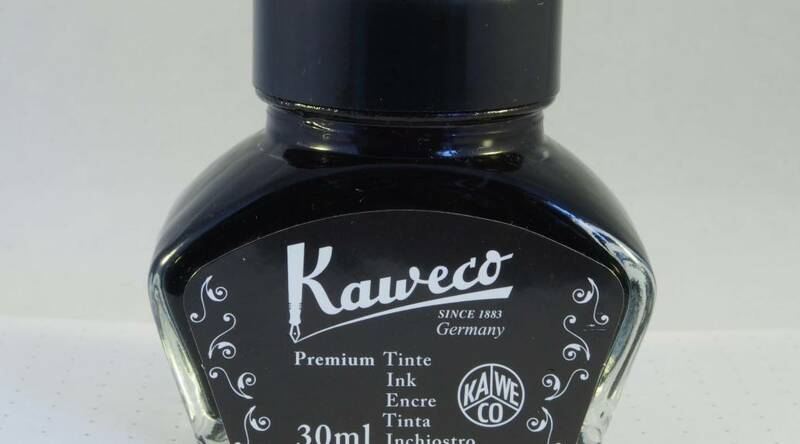 As stated above, this ink was supplied free of charge by Kaweco, and I’ve only found one supplier in the UK of the bottled ink, where it retails at £12.50 for 30ml. I would therefore consider this to be an expensive ink. Cartridges are more widely available. 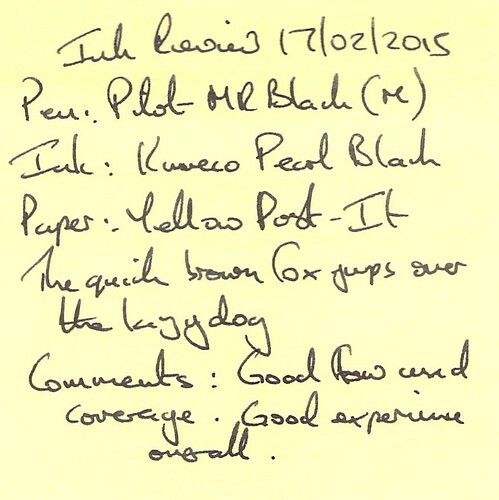 The test pen for this review was a Pilot MR with a medium nib. 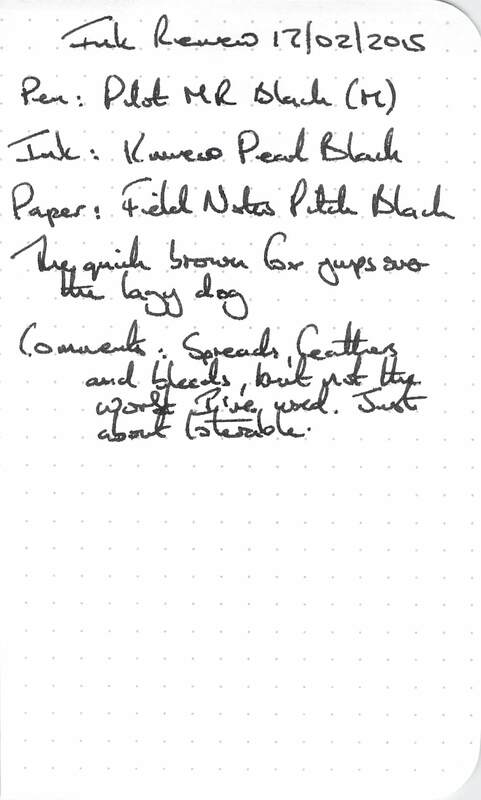 The ink showed very little water resistance, although lines were still present after holding a writing sample under running water. Water drops obliterated any text. The pen was easy to clean after use, apart from a few sooty deposits. Drying time was around 45 seconds, which is not too slow considering some of the results I’ve been getting in other tests. 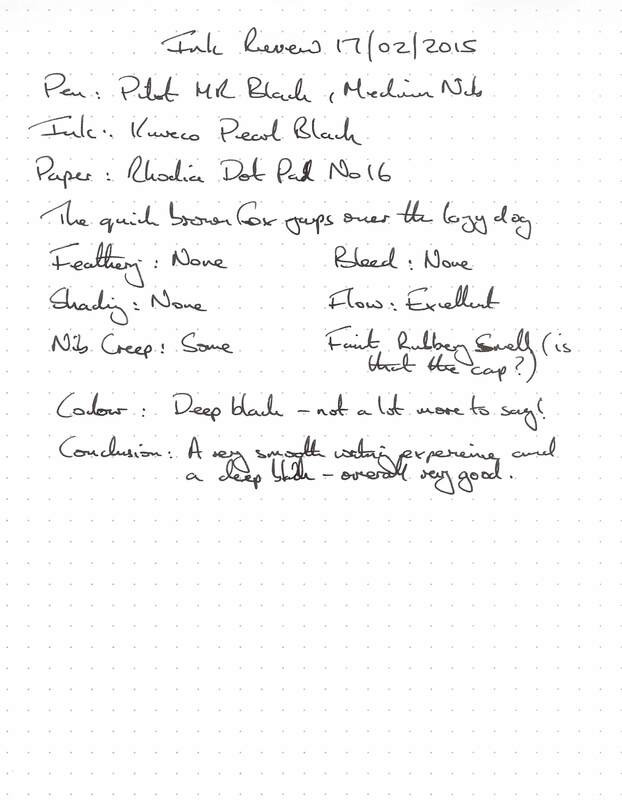 I found this to be a really smooth writing experience, pleasant and with exactly the kind of end result I want from a black ink – deep and saturated with the minimum of shading. Good performance on this challenging paper too. 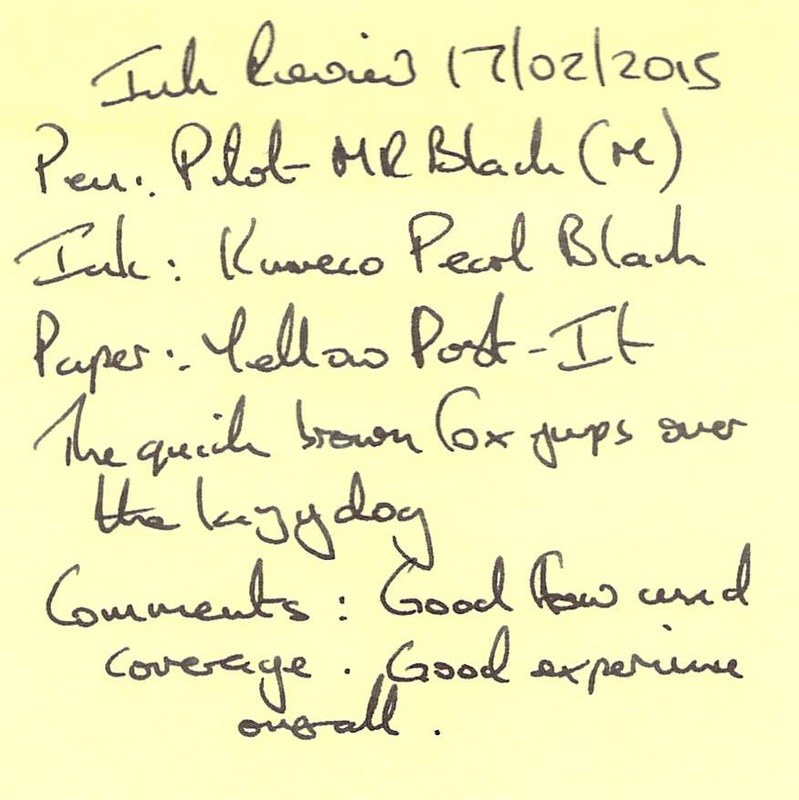 Not as good as on the other papers, but better than a lot of other inks. 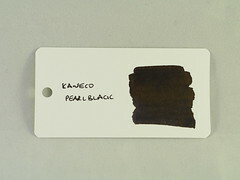 The swab shows a small amount of sheen (not visible in the photo) and a hint of brown (visible in the photo) which do not show in any of the writing samples. 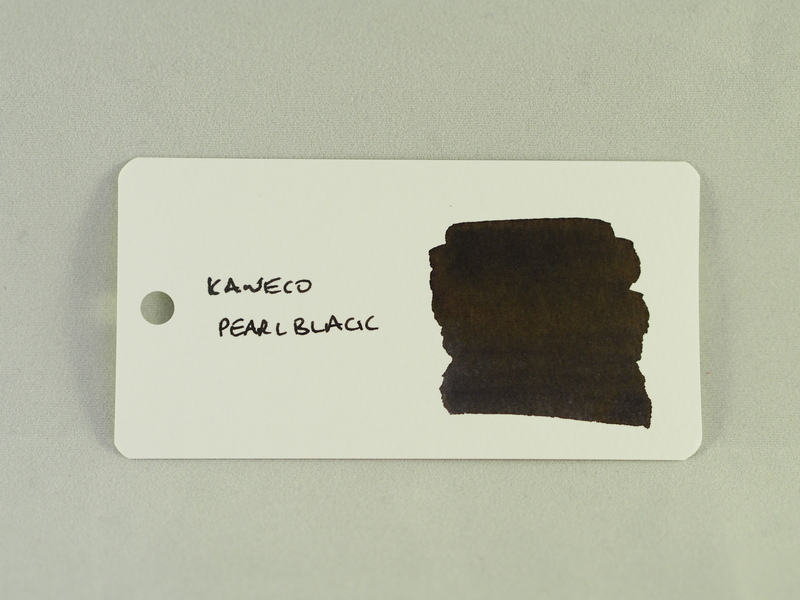 The name of this ink is quite descriptive – there is some gloss to it without it being a piano black. I like the colour and the way the ink behaves, although it would be nice if there was more water resistance. 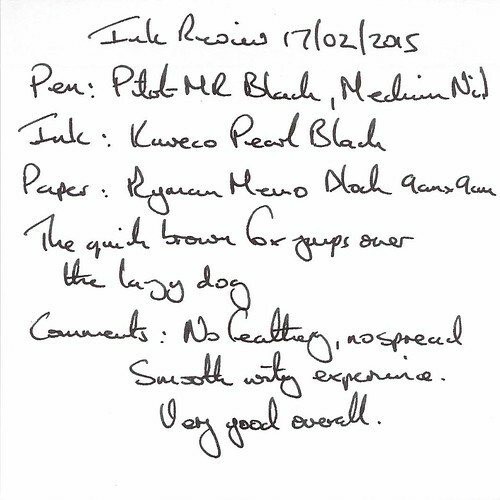 The only thing that would stop me replacing this ink when I have used it up would be the price – there are many inks that perform just as well at a much lower cost. 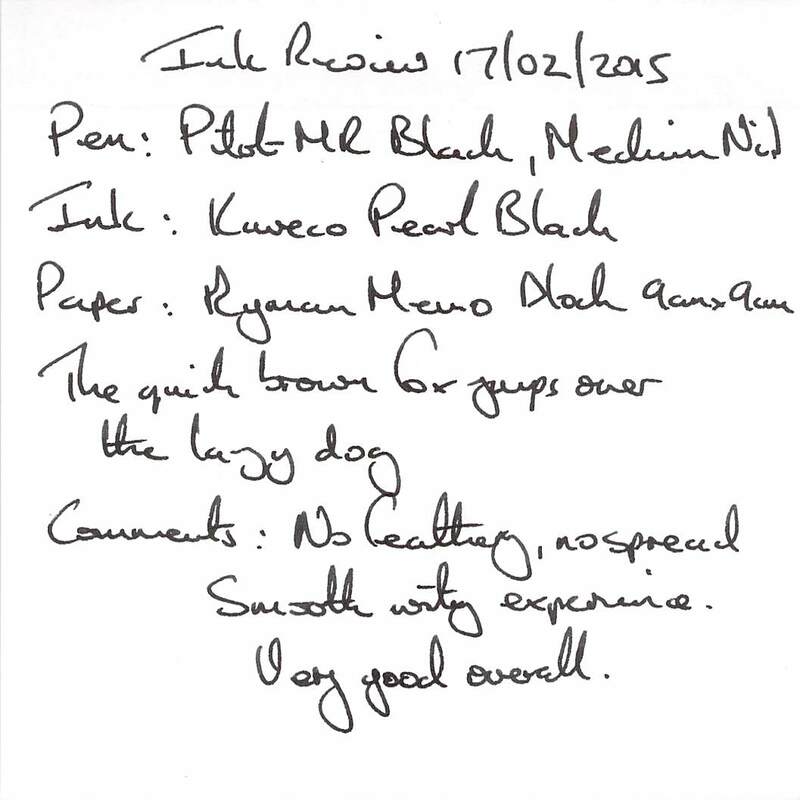 However, if you want the reassurance that comes from buying an ink from a respected pen manufacturer, and are willing to pay a premium for it, then the performance of this ink should not disappoint.